For the longest time I’ve been wondering if it’s possible to make an SCD legal version of fried ice cream. I had never made it before SCD, but I was thinking it sounded good. I decided to try it using SCD frozen yogurt. The key to success is having your yogurt frozen solid and not frying it for too long. Let frozen yogurt soften a little. Form four balls and place into a container. If not using separate containers for each, wrap them in plastic wrap (I used four little plastic containers). After freezing beat egg in a small bowl. Mix nuts and coconut in a medium bowl. Take yogurt out of freezer. 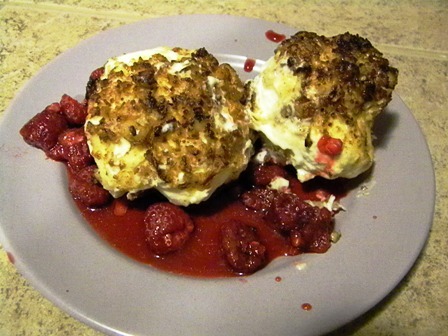 Roll each yogurt ball in the eggs and then in the nut/coconut mixture. Make sure each one is well coated – use more nuts and coconut if necessary. Place the yogurt back into the freezer for several hours or overnight. After freezing again, heat oil in a small sauce pan. When oil is hot, place yogurt ball on slotted spoon and carefully place in oil. It only takes about 5 seconds to fry the coating (this can burn very easily). If the oil is not deep enough to submerge the entire ball carefully turn the yogurt and fry for a few seconds on the other side. Place on paper towel. Place back in freezer until ready to serve. Best if served right away. Serve with berries or other fresh fruit if desired. oh my gosh, that sounds incredible! thanks for sharing!